A quiz about wedding invitations might settle any confusion you have about when to send or how to word your invitations. 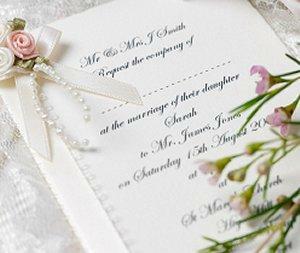 You may wonder if there's anything you shouldn't say on your wedding invitations. Find out before you make an invitation etiquette faux pas. 1. Your guest list is full, but you or your future husband know several acquaintances or distant relatives that are sure to decline because of a substantial traveling distance. Which of the following is your best choice? Go ahead and send those guests and invitation but don't plan on them coming. They're going to decline anyway, and that way you won't hurt anyone's feelings. Send them an announcement after the wedding and/or a small note with a wedding photo after the ceremony. Decide not to bother sending them an invitation or announcement, and then feel guilty or nervous about hurting people's feelings.